Donna Bush and Abigail Glisan are the recipients of the Parents' Association Scholarship. The Sam Houston State University Parents’ Association has announced two scholarship winners for spring 2003. 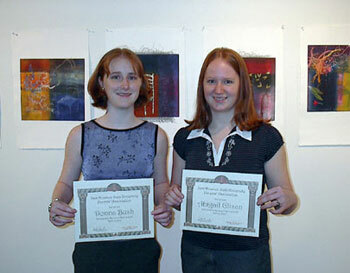 Donna Bush and Abigail Glisan were each recently awarded $1,000 by the organization. Bush is a sophomore biology major from Channelview and is the daughter of Holly Camacho. She is the national communications coordinator for the Residence Halls Association, a member of Rotaract, Tri-Beta Biology Honor Society, Alpha Lambda Delta, and the Honors Student Advisory Council. Glisan is a sophomore criminal justice major from San Antonio. She is vice president of Alpha Lambda Delta, vice president of the Residence Halls Association, president of Spivey House Council and participated in the Freshman Leadership Program. She is the daughter of Roger and Ellen Glisan. Kelly Clements of Tyler, president of the Parents' Association, announced that four scholarships of $1,000 each will be awarded again in 2003-04, two in fall 2003 and two in spring 2004. Eligibility for these scholarships includes that the student’s parent/guardian be a current member of the Parents’ Association, have at least 12 hours at SHSU, have a 3.0 grade point average and not have received a scholarship from the association previously. Applications for fall 2003 scholarships are due by September 6, 2003. Parents who wish to join the Parents’ Association or renew memberships should do so by August 31, 2003 for the upcoming academic year. For further information, contact Mary Ellen Sims, Parents’ Association adviser, at mesims@shsu.edu or 936-294-3026.